Back in September, everyone around me was in a panic. Trump had just announced the end of DACA, the program that has allowed me and so many of my peers to live the way we know we should be able to — as young Americans, going to school and building a career. At that point, I didn’t have time to worry. I was way too busy with work and school to let the fear get to me. My renewal was right around the corner, set for November, and I had no reason to believe there would be any issue with my application. Now it’s February, and I’m undocumented again. An immigration attorney I was working with forgot to include the expiration date of my DACA on the renewal form, and I received a notice that I needed to resubmit. Although I fixed it and sent it back as soon as I got the notification, I was told it was too late. My stomach dropped. Given how much DACA has meant for my life, this felt like a major setback. The year I first received DACA was monumental for me. I graduated high school, got a work permit, and was paying my way through my first year of college. I’ve always had dreams to travel beyond my hometown, and through my school I applied for a semester abroad program in Florence, Italy. I was studying fashion merchandising and small business management at the time, and it was huge for me to be able to be fully immersed in my studies halfway around the world. Without DACA, that would have been a pipe dream. Three years later, I have an associate’s degree in fine arts and I’m proud to say that I just finished studying to become a medical assistant and have started an externship at a nearby facility to complete my certificate. In just a few weeks, I should be able to pursue a full-time job in the field and be able to focus on building my life. But it’s February, and I’m undocumented. Even though I’ve finished my studies, I can’t move forward without DACA. I am one of nearly 20,000 DACA recipients who have already lost protection. Like them, I do not want to go back into the shadows. That’s not who I am. But it’s been three months since I lost my work permit through DACA, and my driver’s license is about to expire. The situation is more urgent now, but I have not lost hope. I know I’m not wealthy. I’m a hardworking American struggling to make my way, just like so many others. But I own cars, I’ve taken out insurance policies, I have a degree, and I’m pursuing a career. Even just on a practical level, I can’t understand why the government would want to throw me out. This isn’t just about me and others in my situation; it’s about what’s best for the country. So it’s hard not to take it personally. I can’t imagine anyone ever wanting to make someone feel the way the government is making me feel. I’ve always had big dreams. I’m bright and ambitious. I’ve lived in New Jersey since I was five years old. I consider myself an American. We’re all here more or less for the same reason — to work hard and pursue the American Dream. I’m grateful, but I still feel so limited. Life without DACA isn’t impossible, but it sure is a lot more challenging. I know it doesn’t need to be that way. What I am asking is for Congress to make the simple, easy choice to let me finish my certificate program and become a medical assistant. I am asking to be able to wake up every morning and drive to work so that I can finish paying my tuition and be able to afford my rent every month. I don’t pretend to know the legal ins and outs of why I may be yanked away from life as I know it. I don’t have time to follow the politics of how my future plays into the agendas of politicians in Washington. I don’t have the resources or schedule that would allow me to protest or visit my senator and convince him to do the right thing. Like other Americans, I have put my faith in Congress to do their job so that I can continue to do mine. 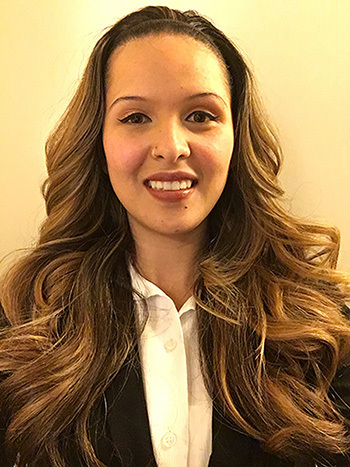 Kelly Guapacha is training to be a medical assistant and is a DACA recipient from Dover, New Jersey. To learn more about what you can do to help people like Kelly, visit www.nilc.org. And you can do more: Call Congress at 1-478-488-8059 and insist that your senators and representatives support and vote for the bipartisan Dream Act now! This entry was posted in Uncategorized on February 14, 2018 by Richard Irwin.